Air Suction Valve - Hero MotoCorp Ltd.
To meet the emission standards, most of the vehicles in Hero MotoCorp are equipped with ASV. Make sure all the hose and tubes are connected securely. 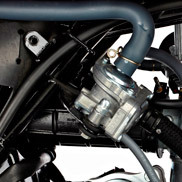 Air suction valve supplies fresh air from the air filter to the exhaust manifold to convert carbon monoxide to carbon dioxide.